Figure 15-16 Close-up of a necrobiosis lipoidica diabeticorum lesion. 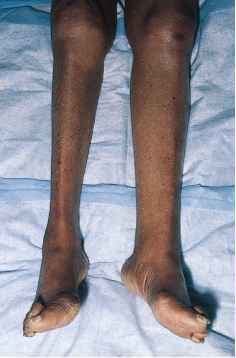 Figure 15-17 Deep vein thrombosis, left leg. Secondary to venous thrombosis, inflammation around the vein may result. 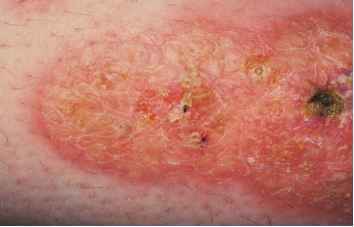 Erythema, warmth, and fever then occur, and thrombophlebitis is present. In many cases, the examiner can palpate this tender, indurated vein in the groin or medial thigh. This is commonly referred to as a cord. Deep vein thrombophlebitis is associated with symptomatic pulmonary embolism in approximately 10% of patients. If the embolus is large, main pulmonary artery obstruction may occur, which can result in death. It is estimated that an additional 45% of patients with thrombophlebitis have asymptomatic pulmonary emboli. Several factors that are important in precipitating thromboembolism are outlined in Table 15-2. An important and common peripheral vascular condition is Raynaud's disease or phenomenon. Classically, this condition is associated with three color changes of the distal fingers or toes: white (pallor), blue (cyanosis), and red (rubor). These color changes are related to arterio-spasm and decreased blood supply (pallor), increased peripheral extraction of oxygen (cyanosis), and return of blood supply (rubor). The patient may experience pain or numbness of the involved area as a result of the causes of pallor and cyanosis. During the hyperemic or rubor stage, the patient may complain of burning paresthesias. 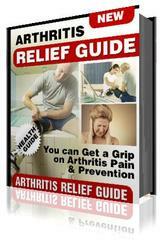 Between episodes, there may be no symptoms or signs of the condition. Raynaud's disease, which is primary or idiopathic, must be differentiated from Raynaud's phenomenon, which is secondary. Table 15-3 lists some of the different characteristics of these conditions. Gangrene is necrosis of the deep tissues resulting from a decreased blood supply. Features of the main vascular diseases causing gangrene of the lower extremities are summarized in Table 15-4. 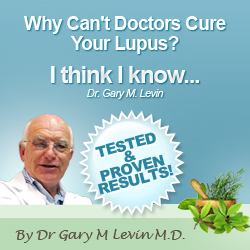 *Such as scleroderma, systemic lupus erythematosus, dermatomyositis, or rheumatoid arthritis. *Affected artery does not have pulsation. Listed here are the specific roots that are important for understanding the terminology related to vascular disease.